All participants must check in for packets pickup/body mark No advance packet pick-up. Registration Center closes promptly at 8:00 am Come early to avoid the rush Be sure to place your bicycle in the correct transition area for your race and attach your bike race number Race numbers must be displayed to your front and worn as you cross the finish line. Giving your race number to another person will result in disqualification. Participation in future races will be forfeited for those competitors who exchange race numbers. No refunds. See refund policy. Entries will be limited to 1000, so register early. Race day registration will be allowed only if field is not full prior to race day. All pre-registered participants will receive confirmation prior to the race if registered by July 1st. NO DOGS PLEASE – Inform your friends and family. Additional spectator info available here. Successive waves go off at 3min intervals. Due to safety concerns on the roads, all Long Course participants must complete the swim and bike portions within 2 hours. Those unable to this will not be allowed to continue to the run segment. Award’s ceremony will be at 10:45 am. 1/4-mile swim, 9 mile bike, 2.5 mile run The swim follows the same rectangular pattern as the long course. The bike ride is relatively flat terrain, through pastoral countryside with the final leg rounding the scenic east end of Pleasant Lake. The course is well marked with distances posted. The run for the finish is of easy striding out around the west end of Pleasant Lake and back. The course is mostly flat with just a slight roll in the middle! 1/2-mile swim, 22 mile bike , 5.3 mile run The swim starts and finishes at the public beach on our beautiful Pleasant Lake. The bike ride is an ideal cycling course of gently rolling hills. The course is well marked with distances posted every 5 miles. Finally, the run around Pleasant Lake is a terrific way to end a challenging race. Swimmers must wear swim caps provided. Wetsuits are optional, except for the Elite Wave. Note: No wetsuits allowed for the Elite Wave if water temperature is above 72 Degrees. All Triathletes are required to wear ANSI/ Snell approved cycling helmet through the bike stage. Competitors shall insure that their bicycle meets minimum safety standards. JMS Racing Services will be providing chip timing. 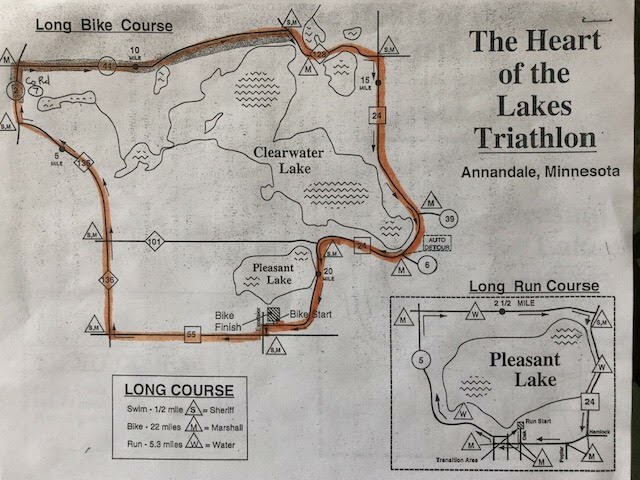 The heart of the Lakes Triathlon will be utilizing the AMB I.T. TIMING SYSTEM to obtain accurate and quick results. No other timing chip may be worn. All participants will be issued a chip and ankle band for use during the event. Overall awards will be presented to the first five female and male finishers for the long course and the first three for short course. Awards will also be presented to the first place masters male and female for both courses. The first three relay teams will receive awards, as well as the first three age group winners male and female for both courses. If you participate in the Elite Wave Long Course, you only can qualify for overall or masters awards. If you register for the Elite wave you cannot win an age group award. All other participants are eligible for age group awards only and not the overall or masters awards. The order of priority will be overall first and masters second. You can qualify for only one award based on the above criteria. No awards will be mailed. You must be present to receive your award. Award’s ceremony will be at 10:45 am. Gear West Bike & Triathlon will provide an optional bike and helmet check at the race site from 6:45-8:00 a.m. the day of the race. For your convenience, stop in at their shop in Long Lake, Minnesota prior to the race. Show good sportsmanship and have fun. HOLT appreciates your participation. Massages will be available in the recovery area following the race. Cost will be $5.00 for 5 minutes and $10.00 for 10 minutes. After the Triathlon fills to capacity, a waiting list will be created from entries that are sent in and spots in the triathlon will be created by those wishing to cancel their registration. In order to cancel, a participant must submit a written signed statement declaring their withdrawal from the triathlon no later than July 1st (cancellations postmarked after July 1st will not be able to be accepted). In exchange for their cancellation, the entrant will be guaranteed a spot in the next year’s race providing they enter and pay by the deadline specified on the entry form. The entrant will be required to pay the entry fee again. In order to get on the waiting list, an entrant must mail in a completed entry form with a check for the entry fee according to the fee schedule when the entry is submitted. The waiting list will consist of paid registrants only. A registrant’s number on the waiting list will determined by postmark only. No phone calls, walk-ins, faxes accepted for the waiting list. Registrations with the same postmark will be ordered by lottery. Registrations from the waiting list will be completed by July 7th. (No further numbers will be assigned). Registrants will be notified that they are on the waiting list. If the registrant chooses not to be on the waiting list, their registration and entry fee will be sent back immediately. Registrants on the waiting list who do not receive a spot in the triathlon will have their registration and entry fee returned to them after July 7th. 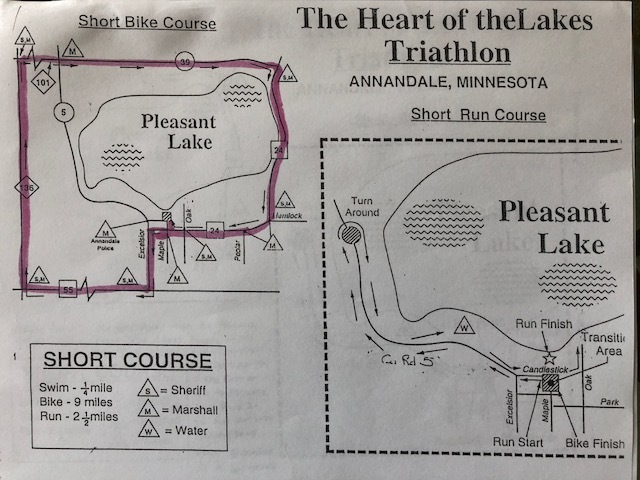 Heart of the Lakes Triathlon © 2019. All Rights Reserved.